Although several options are available for people who wish to replace their missing teeth, one stands out as offering the longest-lasting, more comprehensive solution to an incomplete smile. Dental implants in Daytona Beach are small titanium cylinders that are surgically placed within a patient’s jawbone. Over time, the bone forms a strong bond with an implant, which keeps it in place and provides the strongest base possible for the new teeth that will eventually go on top of it. Comprehensive tooth replacement. An implant replaces both the crown and the root of a missing tooth. This helps to prevent bone deterioration in the jaw and provides a high level of comfort. If you care for them properly, implants have the potential to last a lifetime. The restorations (artificial teeth) on top of them may last for a decade or longer. High success rate. Over 95 percent of implant cases are successful! Natural function. Implants allow you to eat and drink practically anything. Enhanced aesthetics. Implant restorations look extremely natural and fit in seamlessly with the teeth around them — no one will have to know that you’ve had some work done! No damage to other teeth. In many cases, it is unnecessary to extract or file down a patient’s remaining natural teeth before they receive implants. Whether you are missing one tooth or all of your teeth, dental implants may work for you. To replace a single tooth, you’ll need one implant paired with one crown. However, an implant-supported bridge may also be an option if the teeth adjacent to a gap in your smile have significant problems. Your dentist may suggest that you get them extracted in order to receive a bridge. An implant-supported bridge, which has an implant on each end and pontics (artificial teeth) suspended between them works well for individuals who have several missing teeth in a row. If you are missing teeth in various places throughout an arch, an implant-supported partial denture (a single prosthesis that fills in multiple gaps) might be an appropriate solution. If you are missing all or most of your teeth throughout an arch, an implant-supported complete denture could be perfect for you. Both fixed and removable implant dentures are available. Implant placement. This is when your dentist plans for and strategically places the implants in your jaw. Logically, the more implants you need, the more the surgery will cost. Implant restoration. This involves the design and fitting of your restorations. The material you choose for them, as well as how many teeth you’re replacing, has a significant bearing on the price of your treatment. Although dental implants may seem quite expensive, they are a worthwhile investment! The health benefits and confidence they bring, combined with their outstanding longevity, make them an outstanding value. Why not talk to your implant dentist in Daytona Beach to find out if this treatment is right for you? With the right aftercare, dental implants can last for a lifetime. After your implant posts are placed, there is a bit of a recovery process. You are given strict instructions to follow to ensure your healing process is complication-free. Once you have recovered, it is time to protect your investment. By caring for your dental implants each day and visiting your dentist regularly, they can last for 30 years or longer. Do you have questions that need answers? 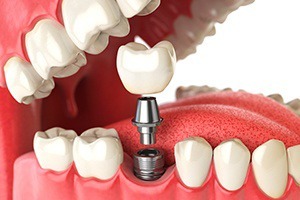 Dental implants have become a popular replacement option for their many unique benefits, but because they’re newer than other solutions like dentures, many people have questions about them. That’s why we’ve included some frequently asked questions along with their answers to give you the useful information that you need before stepping foot in our office. Read to learn more about dental implants as a replacement solution for you.